Here's a Slovenian punk treat! The five songs here are were recorded in 1986 and are a very unique blend of gloomy but fast punk with some experimentation with non-traditional rock instruments (notably an organ and some weird percussive stuff). 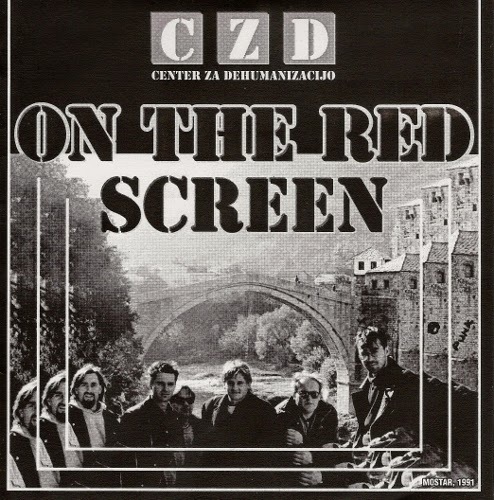 CZD formed in 1984 and have existed in may capacities to this day, also in written word, video, political activism, etc. 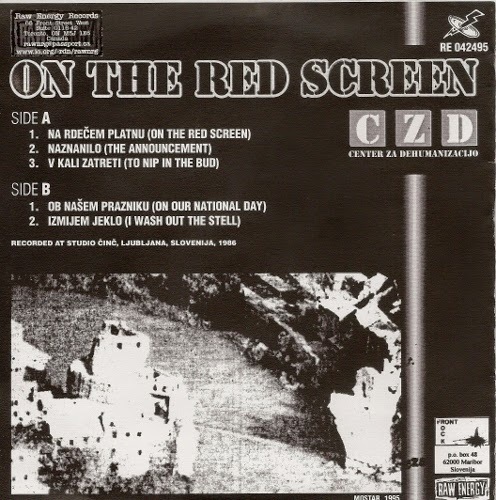 This 7" is particularly cool because it is accompanied by a sort of thesis/cultural analysis by a fellow named Rajko Muršič (professor at the Faculty Of Arts) called Punks In The Village. This was actually published as a book in 1995, and it appears that the whole text is included here, but I'm not positive. Anyhow, it's a very academic but fascinating look into punk and subcultures forming in small villages in Slovenia, and the effects it had regionally. I've included a portion of the text at the bottom. Something must be stressed: rock subcultures have a lot in common with the way of functioning of tribal communities - rock concerts are a kind of a surrogate deep feeling (and identification) with the collective. 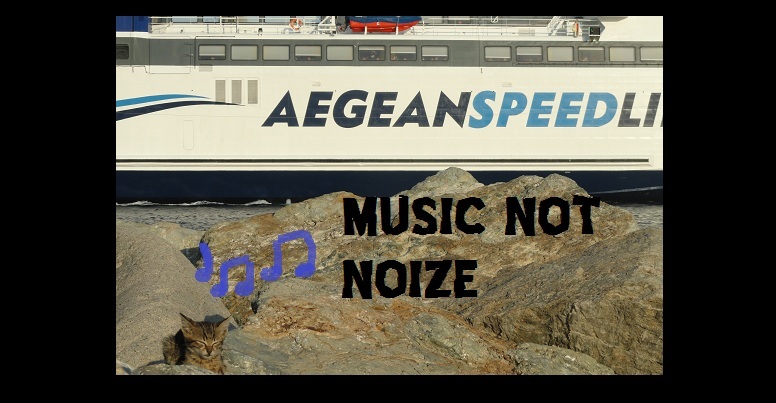 The main theme in rock movements are diversities - not to be the equal to the surroundings is the currency of rock subcultures. Punk was a radicalisation of the rock subcultures: it was provocative, the behaviour or punks was always in opposition to their surroundings, their world was a kind of upside-down "normal" world. The punk pose was a pose of disobedience, their aesthetic and ethical values were a negation of the dominant rules, although punks were never really violent, dirty or asocial. Their whole pose (acting) and their lifestyle was itself a provocation. In Slovenia, the first punks appeared in the 1978 (the band Pankrti), and in the beginning they caused no reactions in the public. The only reactions came form the "older" rockers, who claimed that punk wasn't music at all. When punk became more and more popular, people slowly noticed the new phenomenon, but the individual reactions weren't too aggressive. Everything changed when the politicians and the R.S.A. 's forced a trial against a group of the so called Nazi-punks. In fact, all of the accused were later acquitted. The mass media (under government control) caused a kind of hysteria against the punks and repression became apparent (closing of the pubs and clubs, police oppression, even arrests...). By that time punk came to the villages near the border, too. The elements of pressure in the village Trate, a group of youngsters formed the Club, soon after they organised themselves in the village youth organisation (ZSMS - The Association of the Socialist Youth of Slovenia). The former was necessary, because to be organized politically was then the only possible way to legitimate other common youth activities... Once again, the whole punk pose was provocative: clothes, hair-dressing, speaking, music, dance, art... And, of course, in time it lost its sense. Punks grew up, society was democratised. Although some of them have families now, they are still pretty free-minded. Some of them play in one of the most interesting underground rock band, called CZD. Legitimisation through the success CZD's music is very innovative. It do[es] not come out form the local tradition, in fact, it transcends it. The group plays music, suitable for all the rock places in the world. It is still modern (no more punk) and attractive. But we can trace enough elements of the local characteristics in the activities of the band. The members of the band are as stubborn as the local population is, they are as rude as their surroundings are, and they work as hard as their parents do. Naturally, their career is absolutely different. Their music is part of a planetary popular culture."